Oil Painting Medic: I’m Confused about Alkyd Mediums for Oil Paints. What are They For? I’m Confused about Alkyd Mediums for Oil Paints. What are They For? Alkyds are special painting mediums that are made from an oil-modified resin treated with alcohol and acid, hence the fusion of both words to create a new word, ‘alkyd’. The result is a honey-colored substance that dries quickly to a hard enamel. All alkyd mediums dry much faster than the ‘drying oils’ used with oil paint, enabling the artist to apply a second coat of paint on the following day. Alkyds are designed for glazing techniques as the medium adds translucency and accelerates drying of oil paints. The drying rate of tradition oils can be speeded up to fifty percent, although factors such as the thickness of the paint and environmental factors will come into play. But an oil painting that becomes touch dry in 5 – 12 days will become touch dry in 2 -6 days with the addition of alkyd mediums. 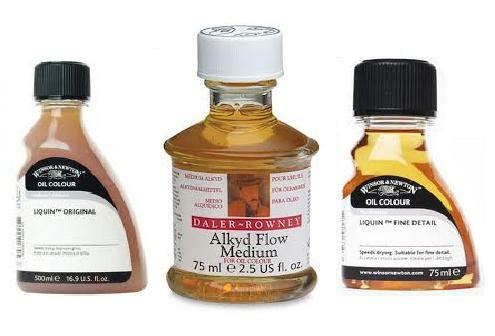 This may help the artist choose whether to use alkyd medium or oil medium in a painting. Or the artist may opt for watermixable oils. Alkyds also leave a semi-matt finish that is in contrast to the glossy finish that different oil mediums such as linseed oil leaves. Having said this, there are is array of alkyd mediums on the market. What are they all for? Although alkyds mediums can be added to traditional oil paints that possess linseed as its carrier, I personally would never use both alkyd medium with an oily medium in a painting. This is because of the two conflicting drying rates of alkyd (fast) and oil (slow). If one area of the painting has more alkyd medium and another has a lot of linseed oil, then conflicting drying rates will be set up and cracking of the paint layer could result. Another no-no is mixing varnish with an alkyd or an oil medium, as some artists do. Varnish is designed for just that, a varnish, not a medium. With this, let’s take look at the different types of alkyd mediums that are available on the market. Liquin is a general-purpose alkyd medium that offers a semi-gloss finish to the oil paint. Of course, it will accelerate the paint’s drying time. It is ideal for glazing techniques and detailed work as it improves flow and reduces brushstrokes. It also doesn’t yellow as some oils tend to do. Although it dries to a pleasing, hard enamel, don’t be tempted to use it as a varnish. Also known as ‘alkyd flow medium,’ this is the most fluid of the alkyds. This medium is designed for the application of high detail and fine glazes as it is lighter in consistency and promotes more flow in the paint. It is non-yellowing and dries to a hard, enamel-like, even surface, ideal for smooth effects. This alkyd medium is similar to Liquin fine detail medium, but leaves a gloss finish, like linseed oil. Again, this medium would be ideal for detail, glazing, and adding flow. A very durable alkyd that is a little heavier and durable than Liquin fine detail medium. Again, a quick drying alkyd medium that leaves a semi-gloss finish. This paint adds body to the oil paint, making it go further and is ideal for impasto effects. Another impasto medium, oleopasto medium offers a more matt finish. Both impasto mediums have a brownish appearance that does not affect the color of the oil paint once mixed in. Add about 1 part medium to 4 parts oil color to thicken the paint. Too much and the pigment in the paint will lose too much of its tinting strength. All alky mediums have characteristics in common in that they are non-yellowing and fast-drying, unlike the oil mediums. They also leave a hard, durable finish. Alkyd paints comprise ground pigments suspended in alkyd, not to be confused with oil paints. However, the alkyd medium can be used with oil paints, hence ‘alky oils.’ Alkyd paints are designed for glazing techniques, but some alkyd mediums such as oleopasto will bulk up the paint for impasto techniques. By their nature, alkyds offer less gloss than oily mediums and accelerate the drying time of the oil paint. Never use an alkyd medium and an oil medium in the same painting, as their differing drying rates could set up pressures in the paint layer, causing cracking. Similarly, never mix alkyd medium with a varnish to be used as a medium or indeed as a varnish. I have used the Liquin in the past and found that it did yellow my painting. The painting in question was a white study that changed to an "antique" grayish brownish tint in less than a year. Hi thanks for comment. Sorry to hear about this. Liquin on the face of it is supposed to be non yellowing, as it is an alkyd resin rather than oil based. I have used it without problem, but sometimes unexpected things happen with art materials due to any one of many factors. It might be worth cleaning the painting with a dedicated painting cleaner or removing the varnish (if it is varnished) as this will attract dirt. Chemicals in art materials can denature if exposed to heat or light. You could contact the manufacturer to alter them of this problem. Rachel, thanks for your reply. No, the painting was not varnished when this happened. It was only 6 months old at the time this happened. I did find that the Galkyd light that Gamblin does not yellow like the Liquin, so I switched over. So far, so good. By the way, I just want you to know that I did not post what I did to advertise Gamblin or anything. I tried some other alkyds, too. The walnut M. Graham had some yellowing but not much. I tried the Galkyd light because someone else was trying it. I had it dry out in a container. It had a white color to it instead of a yellow-y goldish color or brownish color when it dried. Thank you for your blog. It is very helpful.